Meriam Ibrahim was detained on Tuesday, a day after a court released her, annulling the death sentence imposed on her for renouncing the Islamic faith. 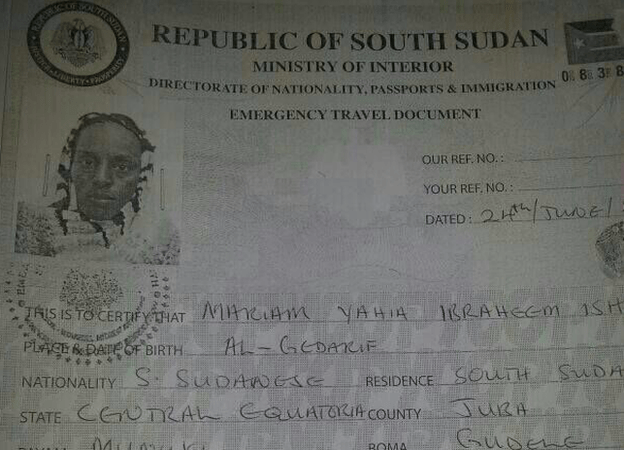 Mrs Ibrahim had emergency travel documents issued by South Sudan when she was detained at Khartoum’s airport. Mrs Ibrahim had reportedly planned to travel to the US with her family. She was sentenced in May to hang for renouncing Islam, sparking an outcry at home and around the world. Below is the alleged forged travel document. I actually want to thank you for but yet another excellent informative post, Iâ€™m a loyal visitor to this blog and I canâ€™t say how much valuable suggestions Iâ€™ve learned from reading your content. I truly appreciate all of the hard work you put into this great blog.